We’re back with Ella Shepherd on eco-friendly living by minimizing waste. In the last Belltower issue, she described her creative trash disposal system: stuffing water bottles. Shepherd does not use a trash can. Instead, she composts, recycles, and stuffs water bottles with everything else. She explained that the goal was to begin building structures out of those bottles, an idea inspired by her aunt, Monelle Riley. But could a water bottle-made building actually last or be sound for the duration of the time it is standing? Shepherd explains that alternative building does not mean that the only material utilized will be water bottles. Other materials are necessary to create a structure that will hold up against the weather and hold the weight of the people and things inside. However, because the majority of the materials used in the water bottle-made buildings are water bottles, it is far more cost-effective than buildings made out of more standard materials. People use a wide variety of materials to create strength in the water bottle framework and use the water bottles in a wide variety of ways. Some people fill the bottles with sand and hold them together with connective string and a mixture of mud and cement. 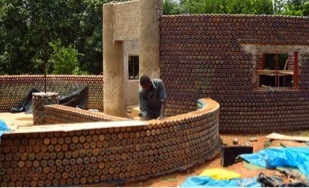 Yahaya Ahmad, a man involved in the preparation of one such project in Nigeria states, “The structure has the added advantage of being fire proof, bullet proof and earthquake resistant, with the interior maintaining a constant temperature of 18 degrees C (64 degrees F) which is good for tropical climate” (http://skoola.com/read_news.php?id=224). Another man in Kenya is building a boat by aggregating littered water bottles from the Lamu Beach and connecting them with heated tar and abandoned slippers (http://coastalcare.org/2011/03/kenya-bans-plastic-bags/). Shepherd’s Aunt Riley plans to use her and Shepherd’s stuffed water bottles to build a garden shed, similar to a green house. While water bottles are the main component of the structures, they can serve as insulation as well. Another alternative form of insulation used by Riley is hay bales. Her current home is insulated with hay, and neither heaters nor air conditioners are necessary to maintain a comfortable temperature. Shepherd hopes to one day build and live in an alternatively built, energy-saving home. For now, she is protecting the earth, one stuffed bottle at a time.